Go to your page’s administration interface. Click the Profile link in Google+ navigation. This page will look a lot like your personal profile page, with fewer editing options. Click the Edit Page button at the top of the page. You’re now in profile edit mode. Any cover photo can be an animated GIF. This means you can have an animation that draws attention to the page or highlights features you want people to be aware of. Don’t make the animations annoying or you’ll drive people away from your page. Profile photo. Clicking your profile photo lets you select a profile photo for your page. This image appears next to every post you make and shows up in the news feeds for people who subscribe to your page. This image is typically 250 x 250 pixels and can’t be a GIF. Make this image as identifiable as possible for your brand. URL. Underneath your main profile image, you see a main URL for your page. The URL is taken from your website field (selected later in this list) and can help establish authenticity for your brand (and Google+ Direct Connect, which enables Google to allow others to circle your page from search results). Tagline. 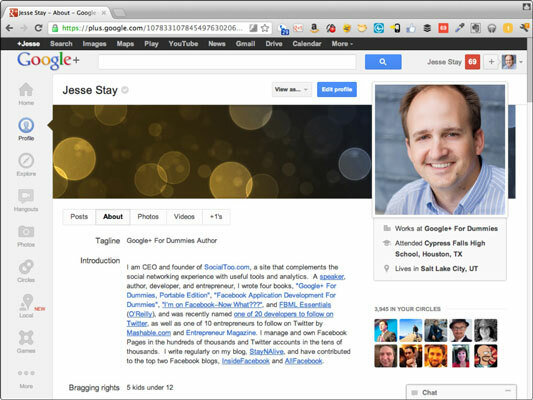 Your tagline can help your Google+ search ranking, so pick something good. Introduction. Here’s where you describe your page a little more thoroughly than your tagline does. Spotlight your page and what it’s about. Add links and format the text to look nice (make it bold, bullet it for lists, and so on). Consider including a link to basic ground rules for your visitors. Contact info. It’s always good to have lots of ways for people to contact you. Choose one or more phone numbers, e-mail addresses, chat IDs, or street addresses. Website. This field links to the URL underneath your main profile image. This is an important field in identifying that you own that URL, because it tells visitors that the URL listed here is indeed yours. 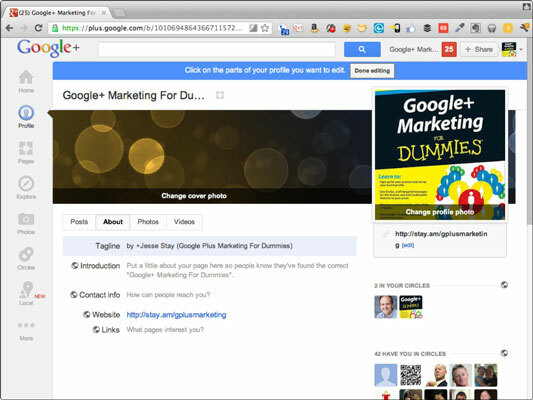 Then you can link your website back to your Google+ page and there’s no doubt that both belong to you. Links. Your main website should be listed under the website or URL fields. If you have other websites to point to, enter those here. These URLs will be less important, but be sure to label them so people know where the links go.